Last weekend we hosted a party to welcome in the Lunar New Year (Việt New Year = Tết; Chinese New Year = 新年)! We made bánh giầy and they turned out beautifully. We want to share the recipe with you! You will see that the ingredients are few (things you would find in any typical Việt kitchen), the process is straightforward, and these are easy-to-make. Bánh giầy (pronounced “ban yay,” sometimes incorrectly written as “bánh dầy” or even “bánh dày”) is a yummy and simple Việt snack. 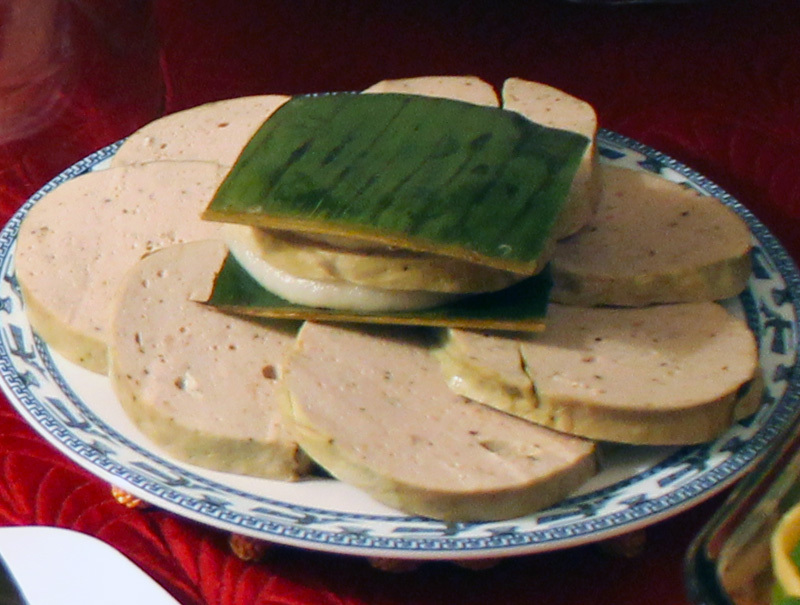 It is a glutinous rice patty steamed on banana leaf, usually served sandwiched with giò lựa (also known as chả lựa, which my family calls “Vietnamese ham,” probably better characterized as “Việt sausage”). 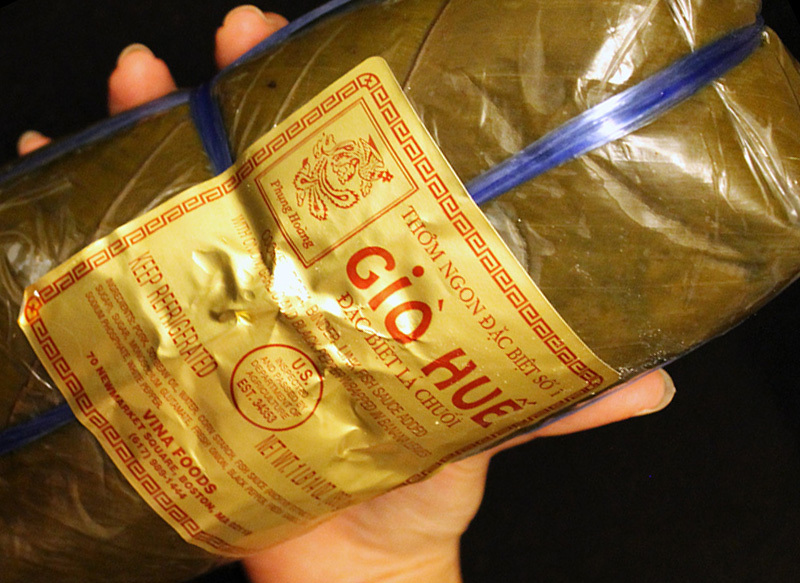 My mom (Mẹ) used to make a batch or two of bánh giầy and a log of giò, stick them in the fridge, and we would take them out to microwave as a snack. When we traveled through Vietnam, my grandma (Ngoại), my aunt (Má Bé), and the rest of my family brought these along for the road trip. Nguyên liệu (Ingredients): This recipe should yield 16 patties (or 8 bánh giầy giò sandwiches). 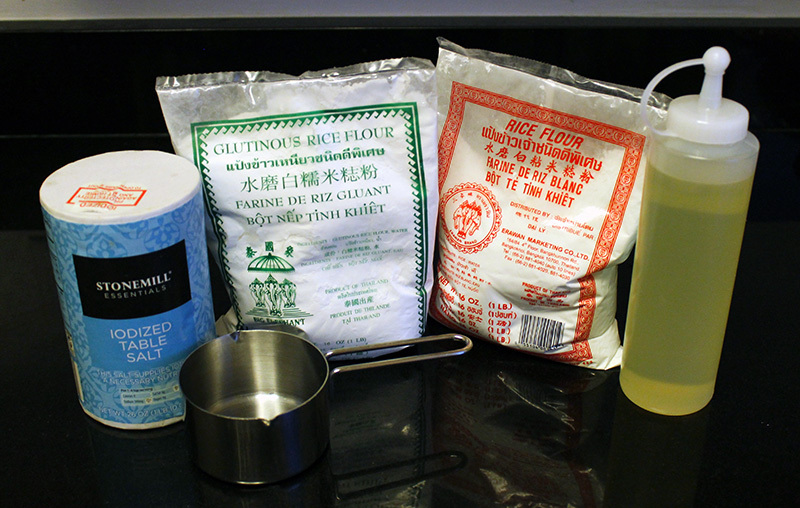 Combine the glutinous rice flour, rice flour, water, vegetable oil, and salt in a mixing bowl. Mix by hand or machine until all dry ingredients are incorporated. 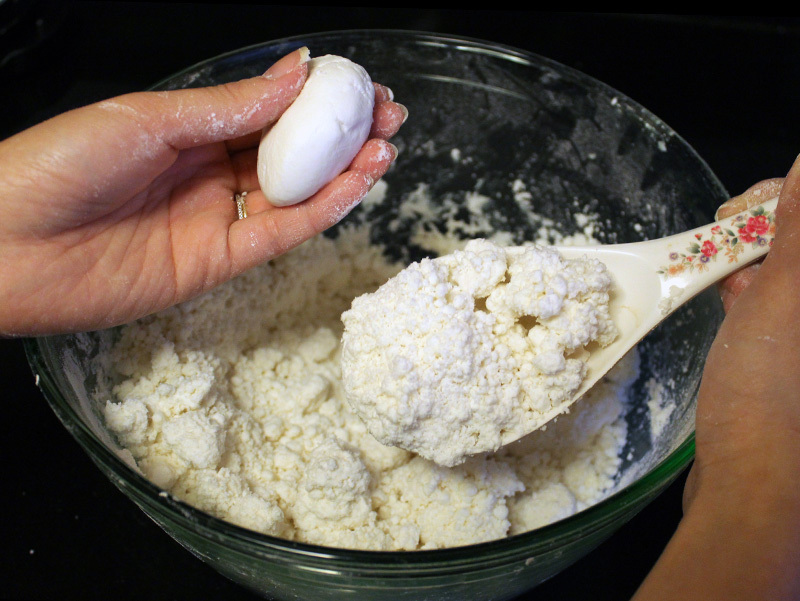 Your mixture will appear crumbly but should become a smooth consistency when squeezed into a ball. Knead the crumbly mixture into a dough. Add additional water, a tablespoon at a time, if needed. 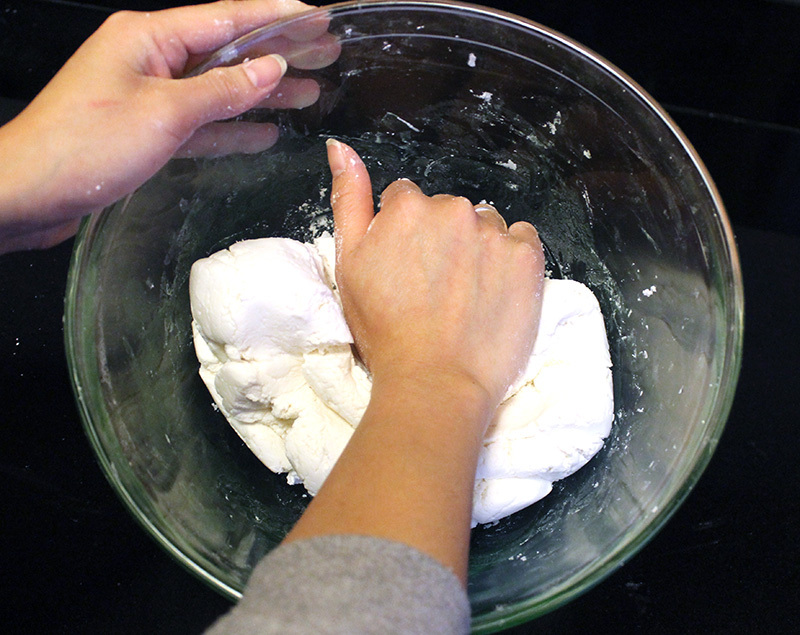 Your dough should be ready when it feels moist but does not stick to your fingers. Make sure that it can stretch smoothly and easily without breaking. If you do not knead enough, your bánh giầy will not be chewy the way it should be. 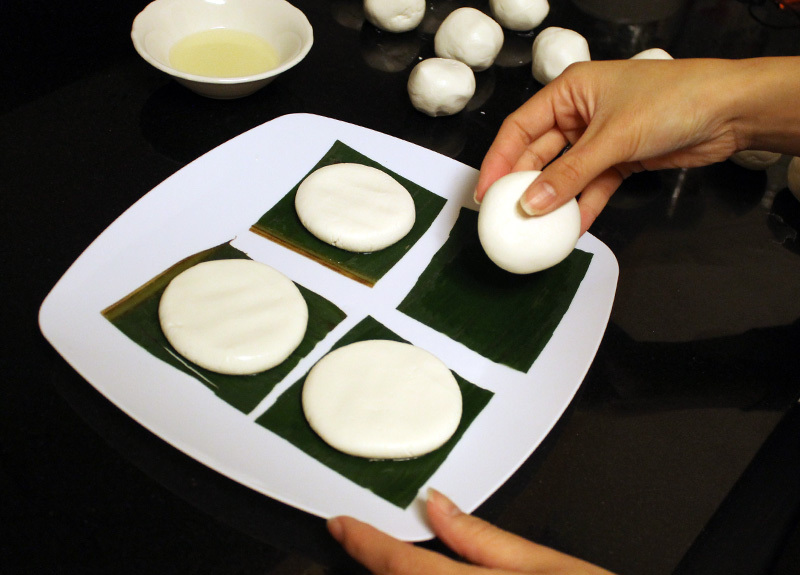 If you knead your dough too much, your bánh giầy will be unappetizingly rubbery and elastic. Once you have achieved the correct texture for your dough, then cover it and set aside to rest at room temperature for approximately 30 minutes. In the meantime, defrost, clean, and dry the banana leaves. Cut into squares approximately 8cm x 8cm. Brush a small amount of vegetable oil onto the outside of the leaf, which is dark green and shiny. This will be the side that contacts the bánh giầy. Divide your dough into 16 portions. 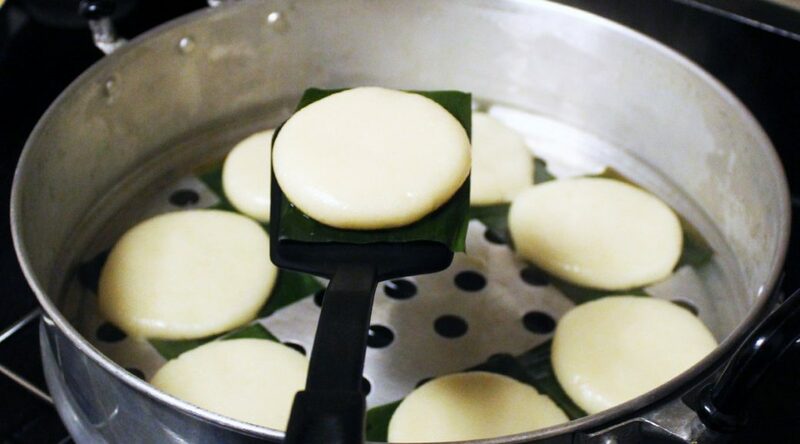 Roll each portion into a ball and place onto a square of banana leaf. Flatten into a disc, approximately 1cm in thickness. Prepare your steamer. 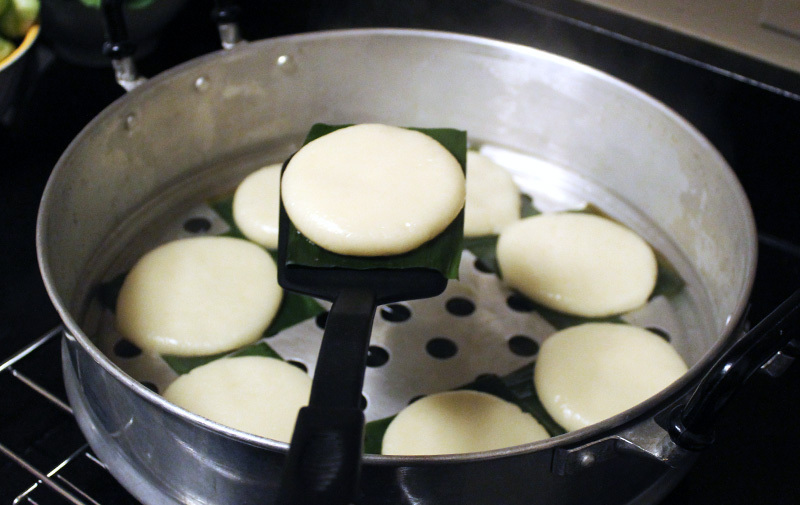 I use a steamer set given to me by my mom (Mẹ). The bottom layer contains boiling water; the middle 1-2 layer(s) are perforated for steaming; and, of course, the top is a lid. 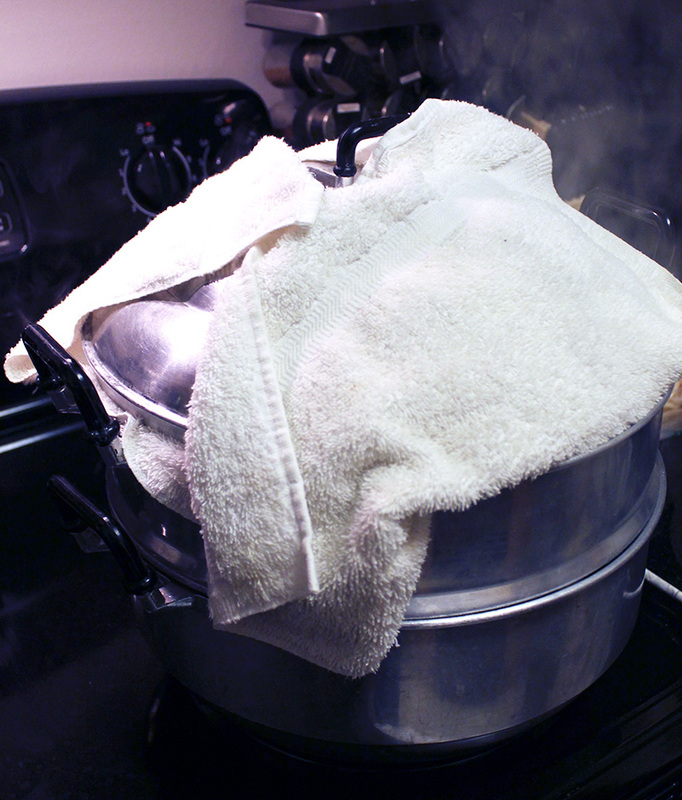 Any steamer will do – even many rice cookers can double as a steamer! Arrange the bánh giầy with a little room between them. They do spread but just a tiny bit. Place a towel over the steamer then close the lid. This is to prevent condensation dripping onto the bánh giầy. Take precautions to wrap the towel around the lid or tie it upwards to prevent contact with the burner; otherwise, this could be a fire hazard. 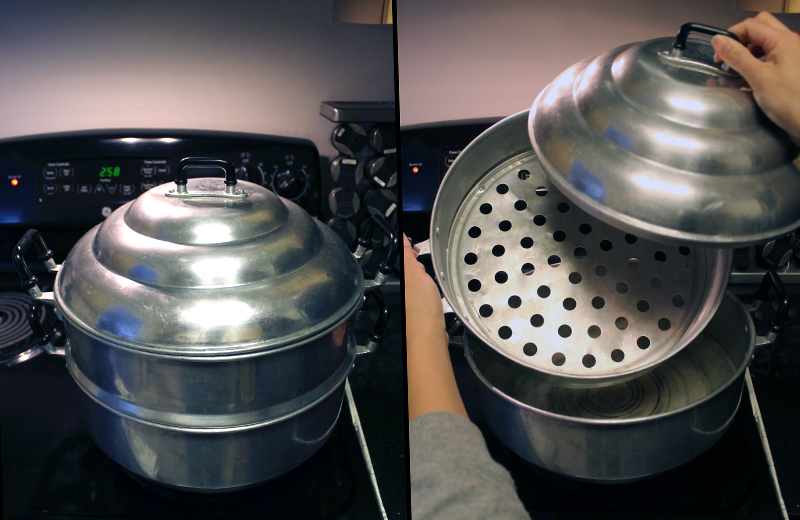 Steam for 3 minutes; remove the lid to release steam. Repeat for 3 more minutes; remove the lid again. Then repeat for the final 3 minutes. The total cooking time is 9-10 minutes. The opacity of the bánh giầy will change from a solid bright white to a slightly translucent but still opaque cream-white color. 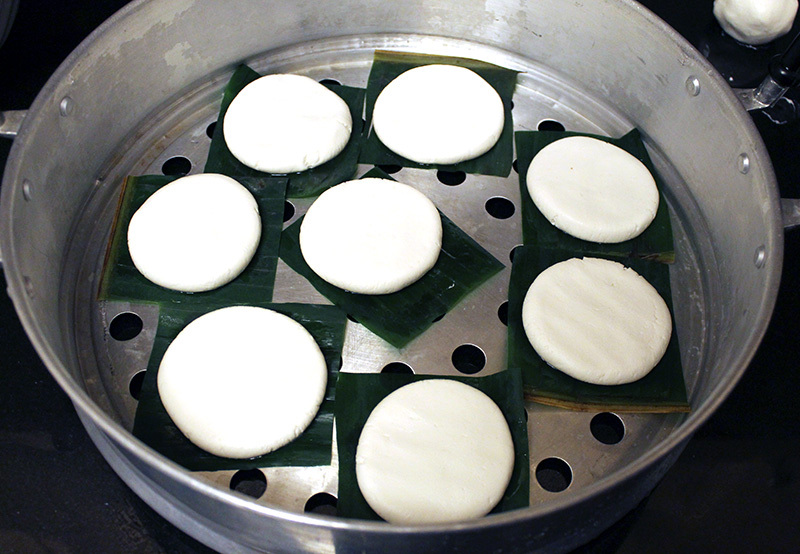 Transfer the bánh giầy onto a drying rack to cool. That’s it – you’re done! 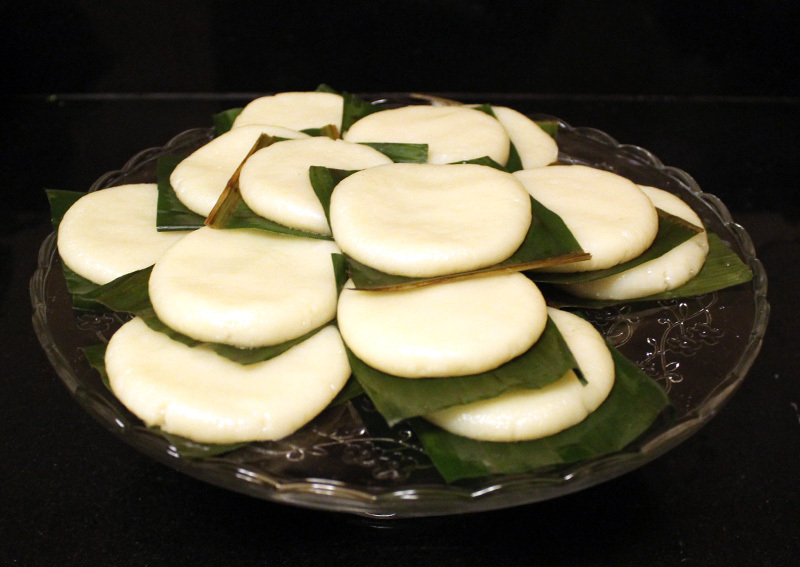 Your bánh giầy should be beautifully round, nicely chewy, with the very slightest hint of salt, and a hint of banana leaf (different essence than banana fruit itself). Deliciously simple. 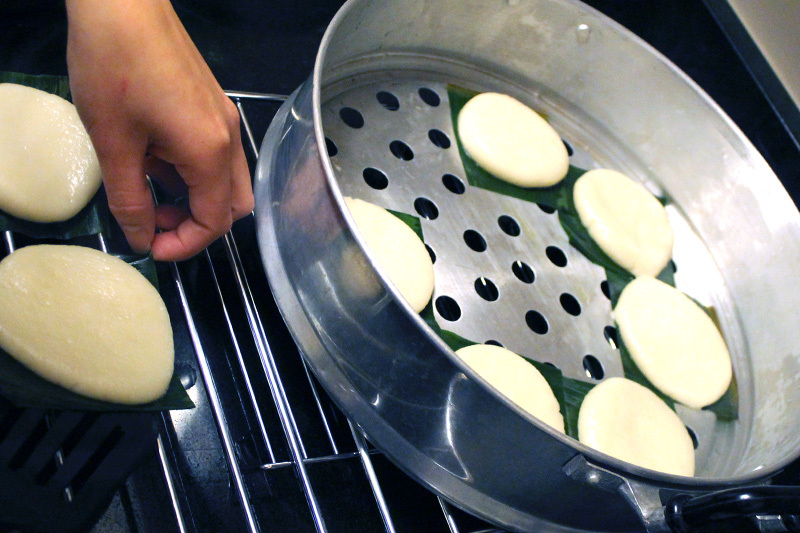 Leave the banana leaf on the bánh giầy as you assemble your bánh giầy kẹp giò (bánh giầy and giò sandwich). The leaf will also serve to keep your bánh giầy moist and prevent your fingers from getting sticky when you handle the bánh giầy! Peel the leaf off sections at a time as you munch. 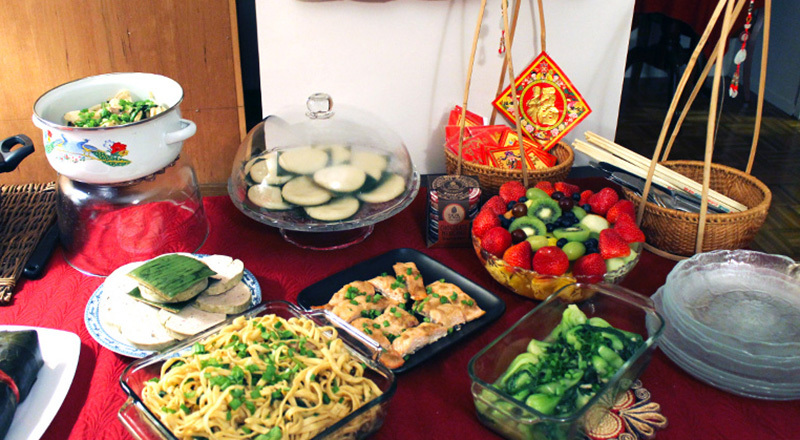 Here’s half of our edible spread from our Lunar New Year party. Thanks to our fantastic friends – Jenny, Evan, Caroline, Jackie, Peter – who generously helped us consume our feast and welcome in the new year. Thanks to you for learning about bánh giầy! We would love to see and hear about how your bánh turn out in the Comments section below. Also, please share your tips and tricks, ideas to improve our recipe by sharing in the Comments section below!